Clunkily-titled Company of Heroes 2 expandalone The Western Front Armies is upon us: in our trenches, petting our dogs, writing our letters home. Our Fraser’s just applying the final lick of insight to his Company of Heroes 2: The Western Front Armies review; let’s get ourselves up to speed in the meantime. The expansion features two new factions – the US Forces and the German Oberkommando West. Each promise “distinct units, new abilities, new upgrades and new tactical and strategic elements” – though presumably, only one side has kommandos. They come bundled with eight new maps, all be playable via Company of Heroes 2’s automatch pool. That’s significant: there, existing CoH players have a chance of trying out Western Front maps before they buy. Relic call the video “eerie” and a “stunning illustration of just how terrifying even the ‘quiet’ moments in war can be”. But is it a grim reminder of the horrors of a war fast fading into history, or a celebration of the chance to play with toy soldiers? The trailer doesn’t seem to know which. Maybe that’s the juxtaposition at the heart of Company of Heroes. Our Jules went hands-on with Western Front Armies, and found the German side tactically unsatisfying to play. 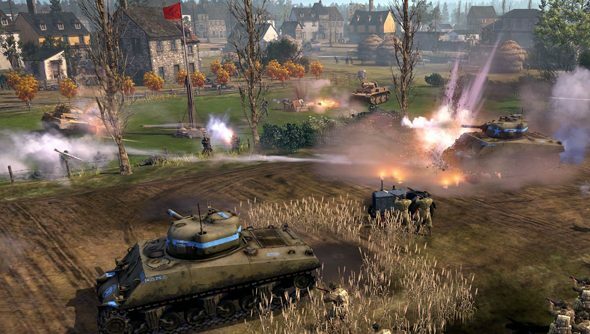 Did you think Company of Heroes 2 recaptured the essence of the series? Buy The Western Front Armies on Steam for £14.99, or in smaller bits for less.